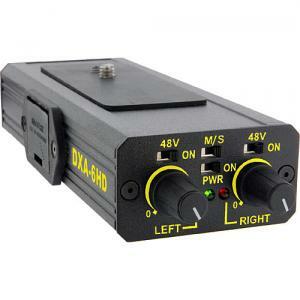 The Beachtek DXA-6HD dual XLR adapter offers 48 Volt phantom power on both inputs for use with condenser microphones, and is universally compatible with any camcorder. The adapter connects to the line input of the Sony FX1 in order to bypass the preamplifier and maintain HD quality audio performance. Two sources may be recorded simultaneously, and each input may be recorded on a separate audio track, making it possible to mix both channels individually during editing. The unit provides channel separation adequate for recording timecode and audio simultaneously and the shielding and XLR connectors are of a professional quality.